Basic Listings are for expert witnesses, forensic experts, legal speakers and litigation support services only. Free Basic Listings display the name of your company, your main area of expertise, a contact, full address, phone and fax numbers. Basic Listings are posted on our directories for the areas of expertise you select. To list your company with a Basic Listing please click on the button above or below, complete the first part of the registration form, add your User ID and Password above the submit button and ignore the payment process. Basic Listings are online within three business days. If your listing is not online three days after being submitted, please take a moment to review it to ensure that it meets our guidelines. We reserve the right to delete or modify Basic Listings without prior notice and do not guarantee their position in our directory. You can upgrade your Basic Listing to a Premium Listing ($295/year) at any time. All listings are reviewed by our team. Use a valid physical address; PO Boxes are also accepted. 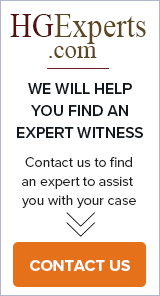 Please select your main area(s) of expertise to be found on our Expert Witness directories, select no more than 50 areas of expertise. Do not use repetitive keywords in the description of your company and services; this type of spamming in an attempt to manipulate search engine results is not allowed and may result in removal from our directories. We invite you to review your free Basic Listing on a regular basis at Subscriber's Login. Please take note of your Password and User ID for further updates. To ensure delivery of important emails to your inbox regarding your HG.org listing, please add directories@hg.org to your email address book or your safe list. For instructions please visit Email Whitelist Instructions.